Designed by Architecture 49, the building features a unique form and massing, high-quality architectural design features, with substantial glazing and a high quality material palette, including an abstract pixelated image of a British Columbia landscape on the podium’s curtain wall glass. 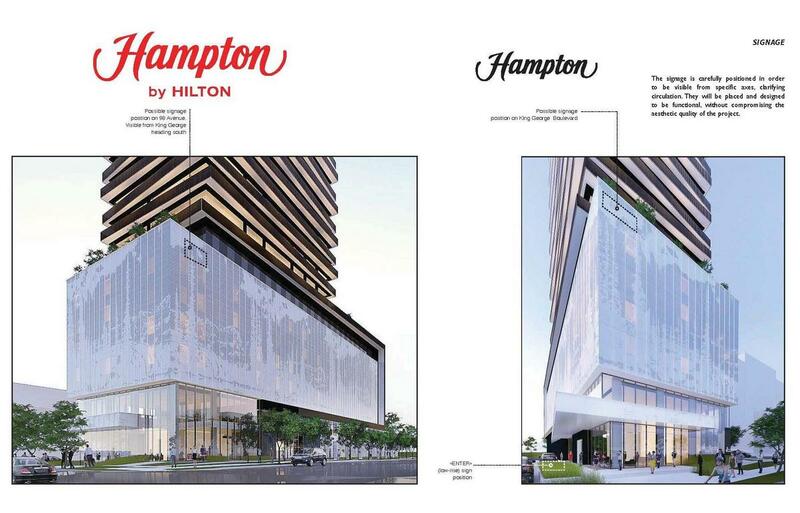 When complete in 2020, the hotel will become City Centre’s second hotel offering an alternative to the upscale 5-star Marriott Autograph Collection – Civic Hotel, which is scheduled to open in November 2017. 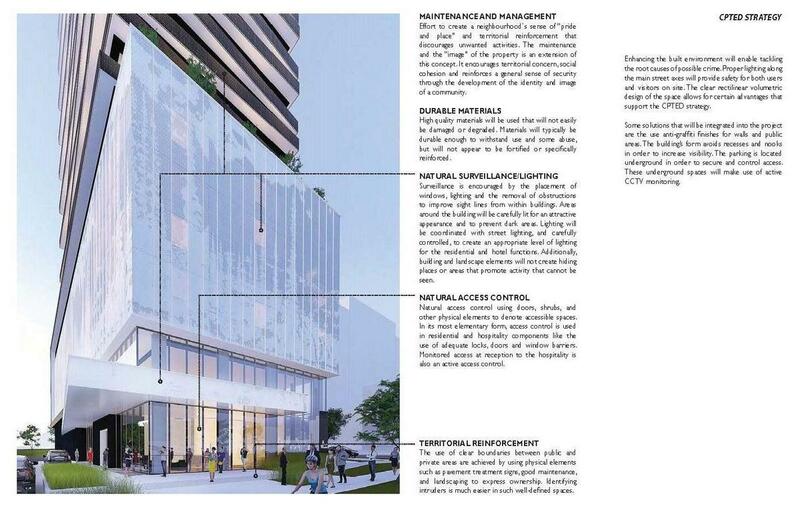 It will serve the growing nearby medical / technology district known as Innovation Boulevard as well as the needs of other business and personal travellers to the area. 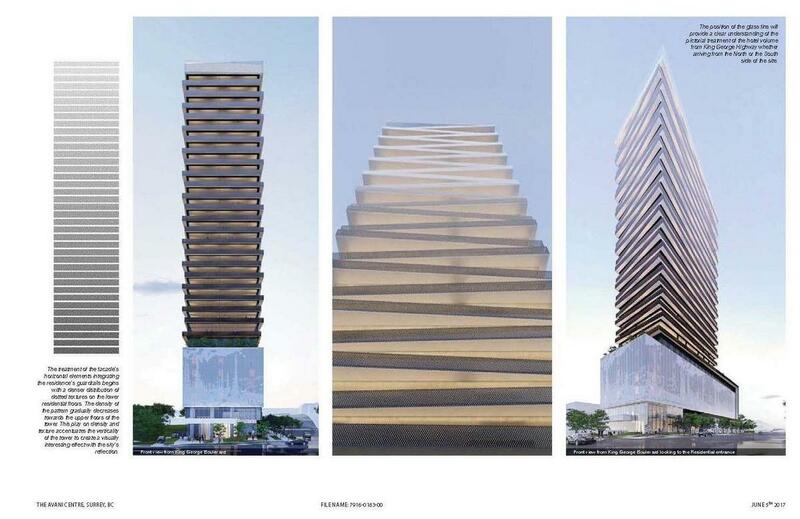 The building will be located directly across from PCI Group’s The Hub at King George project ‘Phase B’, which is expected to begin construction on its 3 towers around the same time as construction would begin on the hotel project in 2018. 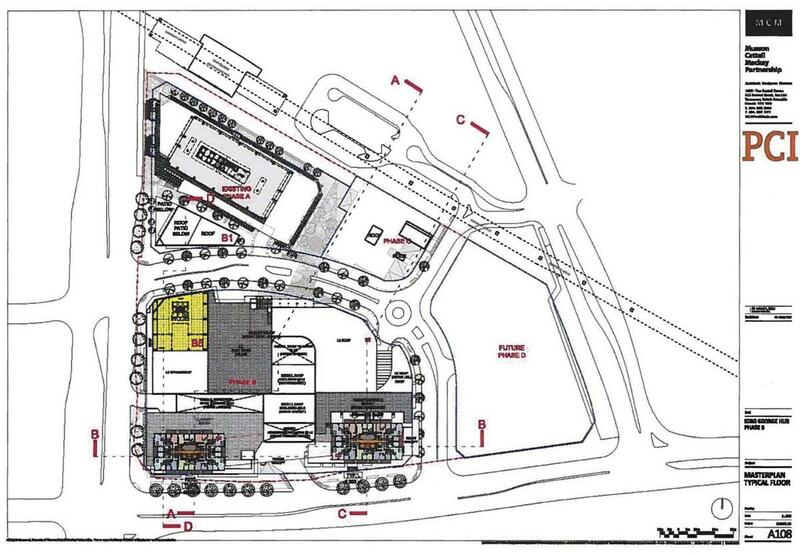 ‘Phase B’ of PCI Group’s ‘The Hub’ at King George Station is returning to Council on Monday June 12. 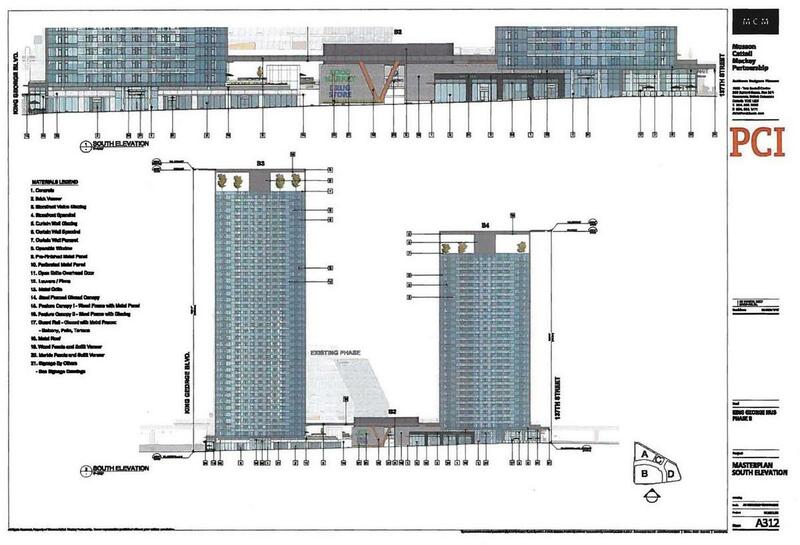 This 2nd phase of the eventual 4-phase project was initially approved back in 2014 under a previous application, but did not proceed to construction. 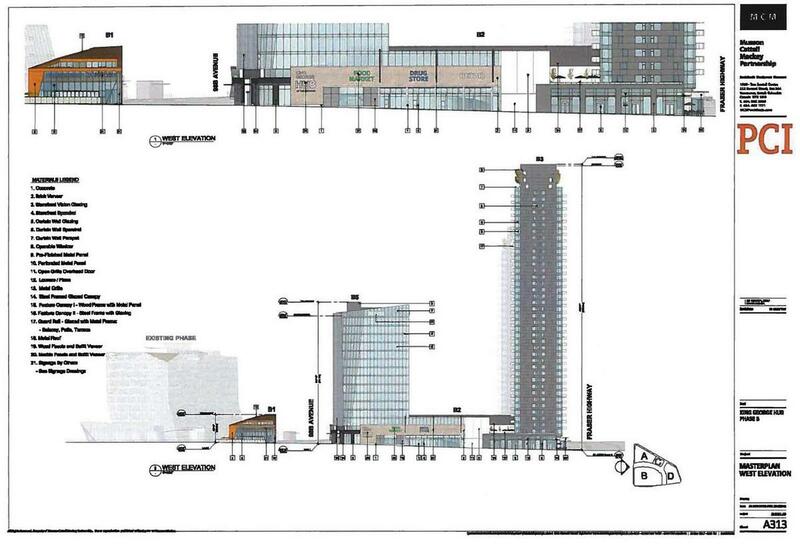 One of the reasons for this was the need for a road adjustment on the site to accommodate the future LRT station along King George Blvd outside the existing Coast Capital Savings building (Phase A of the project). As a result, the road constructed as part of Phase A will be re-constructed further south to allow more space for the LRT station to the north. With this road adjustment has also come a re-design of the project as a whole. 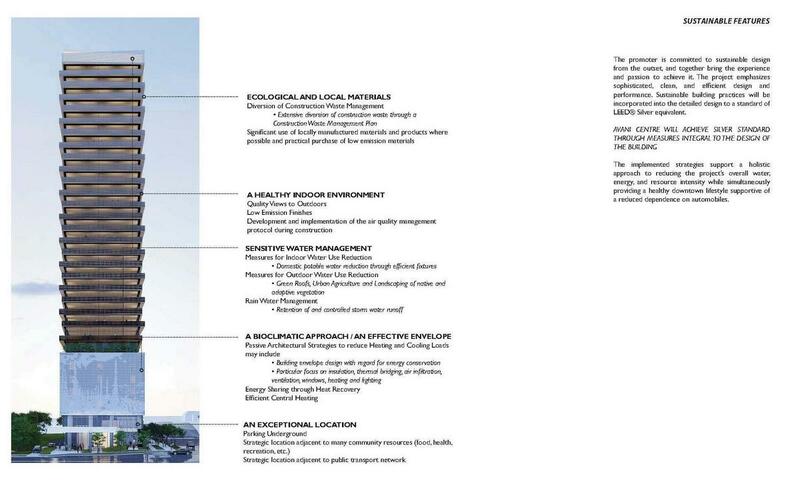 While the concept is generally still the same, the architecture has changed substantially, and the project has grown from 2 towers (as part of Phase B) to 3. A 112,535-sq.ft. single-storey retail podium consisting of two large format retailers (a grocery store and a drug store) and a number of smaller format CRU’s. A stand-alone 9,376-sq.ft. 2-storey restaurant south of the Coast Capital Building. An expanded plaza the heart of the project, which will allow for retailers, such as the grocery store and restaurants to spill out onto with displays and seating to animate the space. 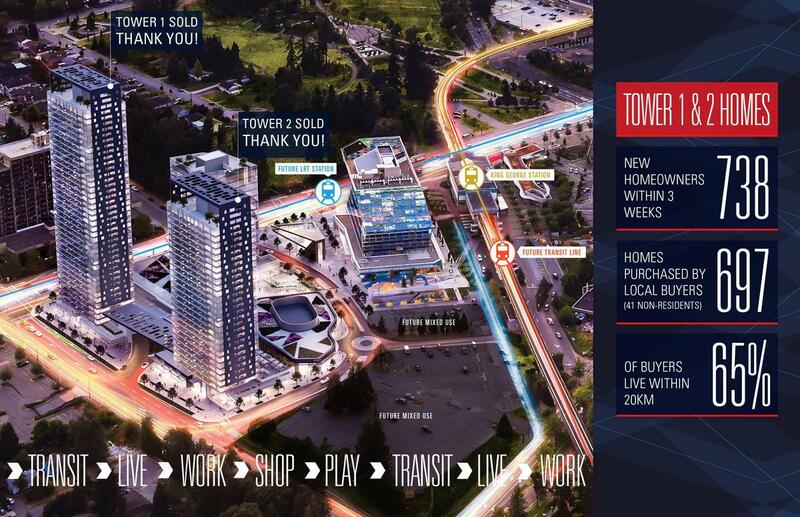 The plaza aligns with the Coast Capital Community Plaza to the north. 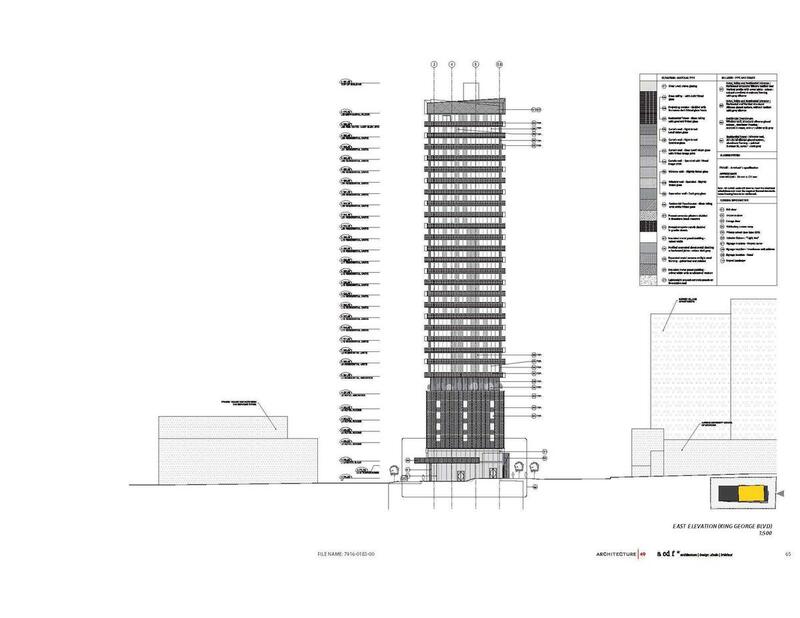 The 40-storey tower is proposed to be accentuated with a “ribbon” punctuated feature cladding on the west and east façades, with a canopy linkage that will architecturally and physically connect each tower and provide an overhead trellis wrapping over an amenity space at each tower’s rooftop. 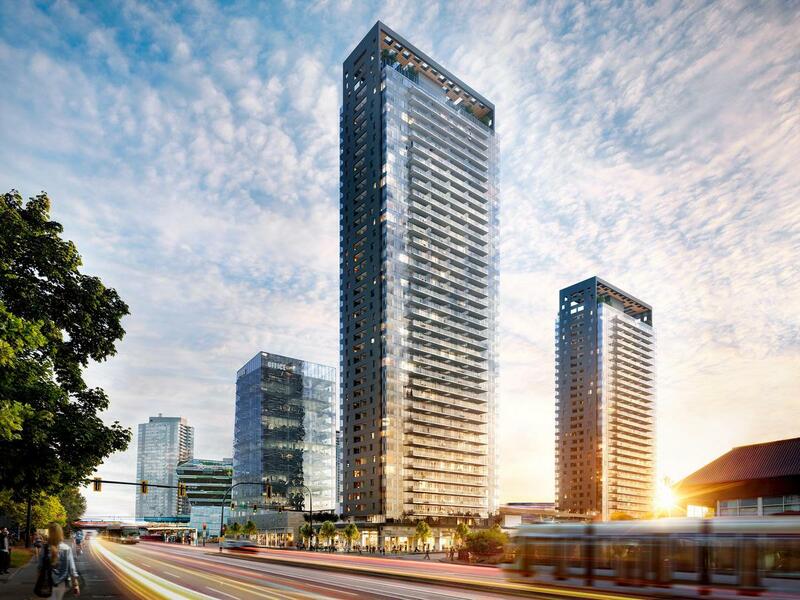 The 29-storey residential tower is proposed as a “complementary tower” and will express the same architectural vocabulary as the taller tower at a reduced vertical scale. Both residential towers are defined by contrasting major elements: refined high performance curtain wall glazing and linear projected balconies providing solar shading and glare reduction to the south, while the west and east ends are distinguished from the curtain wall with the “ribbon” feature punctuated façade with recessed balconies. 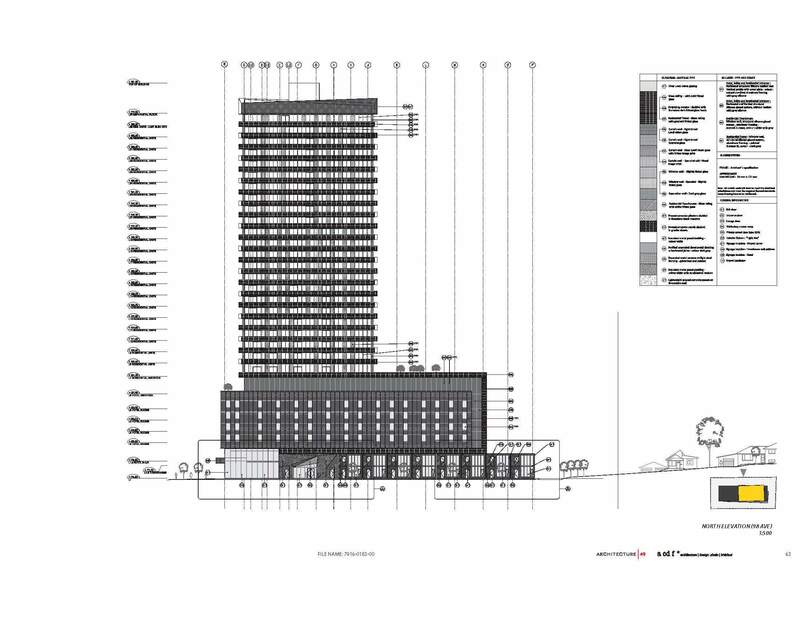 The proposed material palette is broken up to create distinctive buildings on the site. 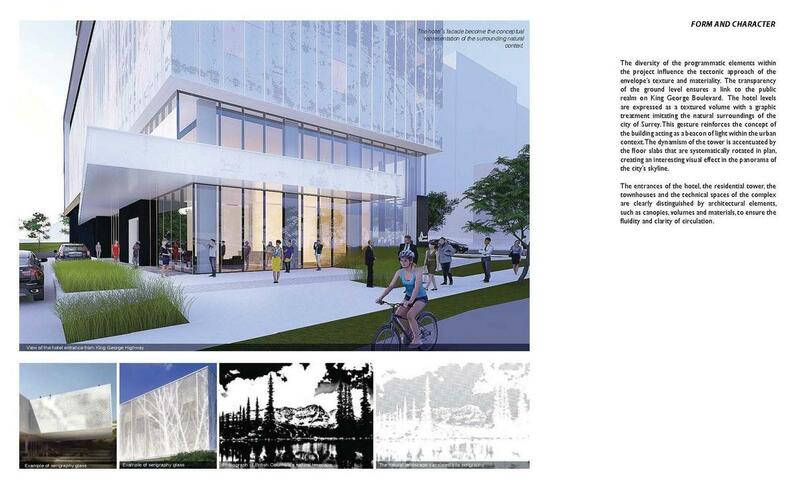 2 locations for public art have been identified. One art installation will be located within the plaza, fronting 98B Avenue and the other art installation will be within the traffic circle of 98B Avenue / 137 Street. 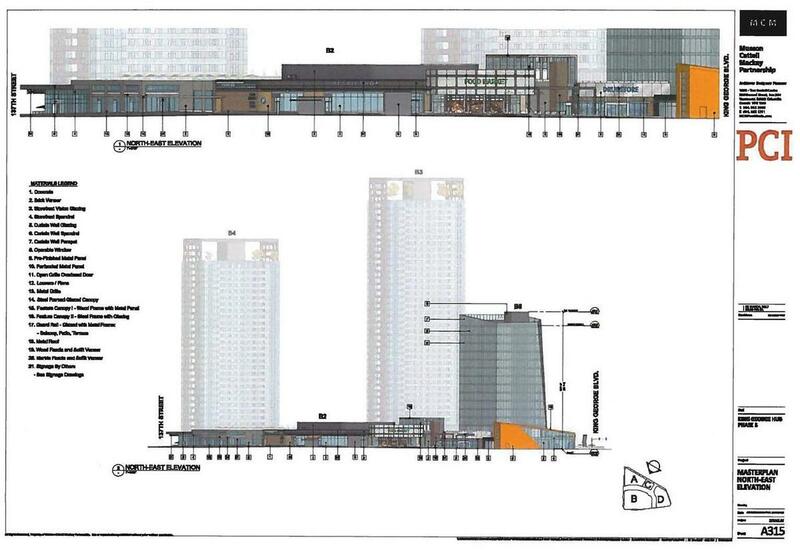 Noticeably missing in the re-designed project is the Movie Theatre that was initially proposed under the 2014 application. It is expected that Phase B will begin construction in 2018 and be completed in 2021.